I apologise in advance for not being able to understand the maps properly: It appear that under the Labor plan, the Cranbourne line does not go through South Yarra station. Correct? Would I be correct in saying that both the current tunnel proposals offer “track capacity” increases as opposed to “service capacity” increases because they increase the track pairs between South Yarra and the cbd from 3 to 4, but the track capacity from the suburbs to South Yarra remains at 3 track pairs? ie we spend $11 billion between now and 2026 to build the tunnel but cannot utilise the the capacity it adds for services until the 4th track pair is added to Caulfield (like the original ALP plan) or even beyond to a point of origin for train services like Westall or future Rowville? So no extra services until approx 2035? I see a service capacity gain for the northern group by redirecting Sunbury, but could this not be achieved today (as opposed to 2026) and for $0 (as opposed to $11 billion) by redirecting the upfield line direct to already electrified Southern Cross platform 8, now that 15 and 16 are open for the RRL to Geelong? You could find an awful lot of the airport line (possibly routing the Bendigo and Northern vline via the airport to Southern Cross), and Rowville line (direct to Flinders street platforms 3 & 4 via the old outer circle to the Glen Waverly line) with $11 billion. I hope the little people who carry letters around in the computer don’t mind me reposting an earlier comment which is more relevant to this thread. The concept is similar to earlier proposals to connect the Burnley and Northern loops  or the Northern and Caulfield loops . In terms of bang for the buck it’s slightly cleverer than the canned Metro Rail Tunnel. 2. connect the Northern and Caulfield loops to make a track pair from Craigieburn to Frankston via Melbourne Central. This needs about 2-3 track kilometres of new tunnel for new chords from Parliament to Richmond and Flagstaff to Nth Melbourne. Compare with 15 track km and four underground stations for the Fishermans Bend proposal. * better options for east-west through-city trips, including more one seat travel on the three through-city track pairs. This is important in light of future Arden and Egate developments. * better connections at Richmond and Nth Melbourne, where all three through-city track pairs pass – this minimises issues like the complaint that the present proposal gives very poor access from the Frankston line to Parliament. 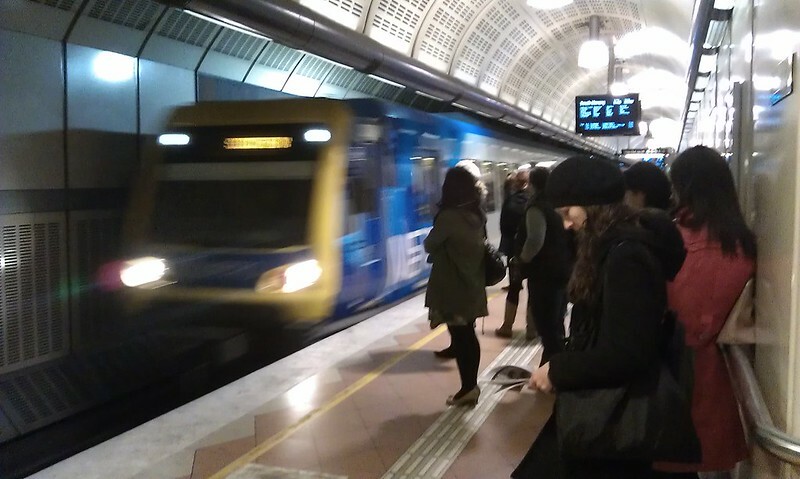 – Glen Waverley/ Alamein/ Blackburn has more patronage than Sandringham, so the advantage of through routing for through-city trips will be enjoyed by more people. – Werribee and Sandringham demand would be unbalanced. This implies either running a lot of empty seats to Sandringham, or terminating some Werribee trains at Flinders St , which undermines the operational simplicity of through-routing. By contrast, Sunbury and Glen Waverley/ Alamein/ Blackburn demand is more balanced, and there is the opportunity to use some of the capacity to increase service on the Ringwood line when needed. or somewhere else on the inner Sandringham line – but there are no good candidates. The tweet about the 401 queue at North Melbourne is interesting. A couple of bendy buses with all doors boarding could clear that queue in one minute. The issue is not total capacity,** but the need for frequent *reliable, regular interval* service. Nominally frequent, but unreliable, isn’t good enough. That’s where the traffic light priority etc comes in. **Maybe the bus timetable should be more frequent; what I mean is, nothing stops that being done when needed — within the range of likely demand capacity is not limited by the state of the road. Daniel, Montague is a stop in a major employment area, one stop prior to the CBD, adjacent to the conference centre and exhibition centre and major shopping district. Analysing it in terms of its value for future local residents to get to the CBD is nonsensical. Clearly its main value is as a destination. In general, the last mile is best served by frequently stopping transport, because otherwise walk-time overwhelms any speed advantages. Naturally residents are better off staying on the tram – except for a few specific trips (at or very near loop stations). This is true for Arden and Parkville too, or would be if the former wasn’t in a black-hole of transport options, but that is a separate issue. Daniel, Montague is a stop in a major employment area, one stop prior to the CBD, adjacent to the conference centre and exhibition centre and major shopping district. Both Stations are in high rise Skyscrapper areas. There is little doubt these stations will be highly patronized. That is why I believe these stations need four tracks similar to south Yarra. But regardless of what you do between city and South Yarra, a dedicated freight line would still need a 5th track from South Yarra to Caulfield, and a 7th track on the Flinders St viaduct, where all the existing tracks would still be used by suburban trains. Surely there would be serious concerns about constructability and environmental impact in these very confined corridors. The alternative is track-sharing, presumably with peak hour curfews. But if you’re track-sharing for part of the route, then all the constraints around scheduling and curfews apply anyway, so there is no longer much advantage in having a dedicated track just for the section from City to South Yarra. Is there any more info about SERL plans in the public domain? Are they seriously considering a 7th track on the Flinders St viaduct? It would be good if the Labor Party could tell us how they plan to connect the new suburb at Fishermans Bend. And has anybody looked at coupling trains to improve capacity? eg, have a 3-car train from Cranbourne coupled at Dandenong with the 6-car train from Pakenham. @John – I’m wondering about the freight details too. All very vague at the moment. @Jacob – Labor party so far haven’t released any real policy regarding Fisherman’s bend as far as I can tell. PTV have however and they were established to be responsible for planning network improvements. A pity they seem to be ignored entirely as the infrastructure football continues to be kicked back and forth in the game of politics. This really sums up the massive disconnect between planning and transport from successive governments. @John With the Frankston and Burnley group (ignoring Glen Waverly) lines being removed from Flinders St and being underground at Southern Cross this would mean the Burnley group would be emptied out entirely (Glen Waverly running direct to Flinders only) from the viaduct and therefore this track freed up, even if the frankston route is still being used by the New Port group. Yes there will be a bottleneck after South Yarra towards Dandenong but I would assume the current slowest point of travel would be getting through the CBD area and potentially the criss-crossing of multiple tracks/lines that freights trains probably need to do. @Jacob I thought cars could not be coupled together unless there were no passengers on board? Also from whenever I’ve seen the process done at Flinders St with the Alamien line (splitting from 6 to 3 usually) it’s never a fast process and would create more delay than would be gained, never mind coordinating both trains arrival into the one platform at about the same time (ie. undelayed). Julian, sidelining the PTV plan was inevitable I suspect. It wasn’t really a plan either, given it didn’t address land-use changes, time-frames under variable growth patterns, costs and benefits of alternate routes, differing project schedules under different funding constraints, integration with other modes and the role of rail, or do any sort of public consulting. They may have, internally, done some of those things, in which case the new route ought to have been tabled before, and its relative merits discussed. There is probably a case to be made that pushing forward growth in Fisherman’s Bend changes those relative merits. If the route genuinely hasn’t been discussed before then the original planning process was worthless anyway. Anybody can drawn lines on a map. I suspect the Arden station from the original proposal would have likely been scrapped anyway, as it would have only been 10-15 minutes’ walking distance from North Melbourne, Macaulay, and South Kensington. I walk past North Melbourne station on my way to work, and the queue for the 401 bus is a regular sight. However, it only takes a 2-3 minute interval between an inbound train arriving and the next bus turning up for that length of line to exist, and then it clears very quickly. I doubt there are many passengers waiting more than 5 minutes for a connection, which is acceptable during peak. @Russ – Of course the plan wasn’t going to run exactly as PTV envisioned it, but for the same government that set up PTV to scrap their key proposal within 12 months of them releasing their plan, well that utterly undermines the job they were set up to do. Also if newspaper reports are correct, this entire idea was hatched “a matter of months ago” months ago. If the route genuinely hasn’t been discussed before then the original planning process was worthless anyway. Anybody can drawn lines on a map. This only highlights the problems with this plan. There is no evidence the planning work has been done. – a track pair from Werribee to Sandringham. No spare tracks. A ‘dedicated freight line’ through this area implies a new 7th track. @John – your right, forgot about the fact that the direct through routing would now require two track (ie. both directions). @Steve and John, the (publicly available) briefing documents for the Flinders Street design competition explicitly foreshadowed the building of another two-track viaduct from Flinders Street (platform 10 and a reinstated platform 11) to Southern Cross. Presumably, SERL will use that; it would certainly make sense: keeping freight and V/Line trains separate from Metro trains. The Melbourne Rail Link frees up the track pair running through platforms 3 & 4 at South Yarra and Richmond for SERL: there’ll have to be a flyover for the Newport-Sandringham track pair between Flinders Street and Richmond. Julian, I agree, but the PTV undermined their own credibility by not releasing – at least publicly, and probably privately – the case for Melbourne Metro I/II versus other routes. The lack of proper planning dates back years – probably to the 1960s if not before. Optimally, a plan shouldn’t present any options at all at the strategic planning stage; it limits and bends future considerations in ways that work against efficient solutions. Once people are invested in a particular project, no matter how ill-conceived, the whole process bogs down for decades. A project of this magnitude, with no business case, six months from an election, is not likely to go anywhere soon, on any route. 1. Longer stopping times for unloading on the Sunbury/Dandenong lines at Flinders St may reduce throughput? Considering all of these, and using the Rail Development train frequencies in stages 2 and 3 as an indication of what can and can’t be achieved with different infrastructure I have estimated that the new route will probably lead to a total of 5 less trains in the peak hour. An extension of the (still) proposed second proposed tunnel from Clifton Hill to Flagstaff, Southern Cross and Fisherman`s Bend under the Yarra to connect with the Newport group is reasonable. However, due to the restricted space at Newport limiting capacity there, I would have the Newport portal at the north end of the Newport Workshops facing the Werribee line (much gentler curves for the trains to go around) with a new underground island platform at Newport. The Werribee line could then have a faster trip into the CBD and the Williamstown line and possibly the Altona line could serve the existing tracks via Footscray. The Newport Sunshine line is also not suitable for passenger traffic. Also, splitting the through-routed line on the south/west viaduct between Flinders St and Southern Cross would reduce the capacity of both those lines to half the capacity of the tunnel. It will not only be the Glen Waverley trains using the direct line from Richmond to Flinders St. Alamein and possibly Blackburn trains will as well. There is a plan to quadruplicate to Camberwell and then eventually Box Hill. Running longer trains through Flinders St would not be that hard. There are already unused sections of the platforms 3-9 under St Kilda Rd and Federation Square although it may be necessary to put platform entrances through Federation Square (which should have been either built when Federation square was or at lest planned for, but wasn`t). That provides for 7-8 cars at least and will be enough to be going on with. Why not upgrade the #401 to a tram service? I’d rate the Swanston St plan as superior, because the routes are more direct, and because more of the routes have better access to the CBD under that plan. One way to compare these schemes, is to consider the fraction of the 9 suburban corridors which access the key CBD stations, which for the purpose of this comparison, I am going to arbitrarily use Southern Cross, Flinders St and Melbourne Central. That’s a net score of -2 for accessibility for the latest plan. To put this another way, if you consider the permutations of 9 suburban lines and 3 CBD destinations, that is 27 different routes, and the north/south tunnel plan provides direct access for 21 of those 27 routes. And the latest plan provides direct access for 19 of those routes, which is arguably inferior. Hmm.. so everyone on Belgrave/Lilydale lines that want to go to Parliament, Melbourne Central or Flagstaff will have to change trains? That’s a LOT of people changing trains who don’t currently have to. Catching up now on all the comments! @Roger (Fri 8:09am), correct. Under the old PTV plan (now supported by Labor), Dandenong trains would pass under South Yarra in the tunnel, but not stop there. @Mark (Fri 8:41am), the third track pair would be most likely re-used for freight and V/Line in the future. It’s the Dandenong line package which would be the thing that will really increase capacity on that line. @John (Fri 9:49am), re: the 401… yeah I think a few more buses, possibly larger buses, but most importantly, traffic light priority, would fix this. On the occasions I used the 401, the bus spent an awful lot of time waiting for traffic lights, some of which are on fairly quiet streets around North Melbourne. @Russ (Fri 10:12am), I can see Montague is potentially a major employment area, but it’s not at the moment – nowhere near the level of Parkville. The proposed station is not anywhere near as convenient as the trams for the convention centre or the existing shopping centre. @John (Fri 10:44am), there are proposals for a fifth line between South Yarra and Caulfield, and at least one additional track between Caulfield and Dandenong. See this Age article which described the future vision: About 15 to 20 per cent is moved by rail, along a new freight line between Hastings and the sprawling Dynon rail terminal west of the CBD, called the South Eastern Rail Link. Trains up to 1.5 kilometres snake through the south-eastern suburbs along a third track recently built next to the Dandenong railway line at a cost of more than $3 billion. In the dead of night they thunder past the backyards of homes in Caulfield, Malvern, Armadale and Toorak. See also Michael’s subsequent comment about the SERL. @Jacob (Fri 11:02am), as someone mentioned… coupling/uncoupling trains is possible, but time-consuming. It does happen at Ballarat at present, but isn’t really that great in an urban context. @Tranzitjim (Sat 4:02pm), I’m not sure trams would help. The real issue at present is the speed of the vehicles, and getting them through intersections. @Phil (Sun 9:33pm), No, check the map at the top. Belgrave/Lilydale trains would run Richmond, Parliament, Melb Cen, Flagstaff, Southern Cross, then to Montague, Domain, South Yarra and to Frankston. So someone seriously thinks they can build a fifth track for freight from Sth Yarra to Caulfield? These are suburbs of articulate, well-to-do people. It would make the fight over high rise at Camberwell look like a tea party. Seriously though: in an alternative universe where the politicians of the 1850s were not quite so stupid, and the nation’s railway are standard gauge, Hastings freight would be be sharing tracks with suburban trains already, and no-one would think twice about it. Surely track sharing with dual gauge is the way to go. None of the relevant tracks are ever likely to want more than 8 per hour off peak suburban service, and a freight train can easily be slipped into a 7-8 minute gap. Peak hours curfews would be needed, but how important is that? I know there’s an issue with intercapital freight and early morning arrivals (which the market wants); but maybe with port shuttles the pattern of demand is more flexible?? Just for mine if the dandenong trains run express from Caufield to South Yarra & the freight trains do the same is there really likely to be a problem with track sharing/capacity especially with modern headway signalling on this line. As long as freight trains can bypass the stoppers without slowing at SCS, FSS, South Yarra & Caufield then it should be some time before demand overtakes the cappacity of these tracks with modern signals. One thing that was missed is the Metro Tunnel will be more convenient for those using the RRL that which to go to the Royal Melbourne Hospital or Melbourne University. With Metro Tunnel, passengers that have travelled on a train via the RRL, will alight at Footscray and change for a suburban train that will take them directly to Parkville. With Melbourne Rail Link, those travelling via RRL would have to alight at Footscray, then take a suburban train to North Melbourne and change for the 401 bus OR take a suburban train to Melbourne Central and change for a tram. The Metro Tunnel gets better value out of the RRL then the Melbourne Rail Link. Frequency of service is a major issue when trains are super packed, and sometimes can’t even get on. From what I hear, they cannot increase frequency not just from the existing tunnel perspective, but because of level crossings (impacting traffic). Wouldn’t it then stand to reason that without grade separation between rail & road in the burbs, neither of the tunnel proposals could run at the claimed additional capacity anyway?